The museum is housed in the village's third depot. 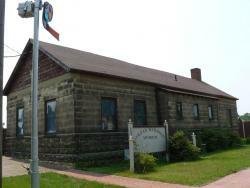 Built from sandstone quarried nearby, this building was constructed between 1914 and 1915 on the foundation of the second depot, which now serves as a personal residence. In 1958, a large storm tore through western Wisconsin, producing many tornadoes, one of which hit the freight house on the depot's west side. The wall from the women's waiting room was rebuilt from the rubble, but the freight house was never restored.